The Cinematic Experience: Sonic Acts XII is a book I edited together with Boris Debackere and Lucas van der Velden on occasion of Sonic Acts XII, 2008: http://www.sonicacts.com/2008. The publication is for sale at Amazon. Consider purchasing it. On request I can make digital copies of my own interviews available at no cost. On the occasion of the twelfth Sonic Acts festival in 2008, Boris Debackere and Arie Altena edited a multi-faceted book with nine essays and ten interviews dealing with various aspects of the cinematic experience. 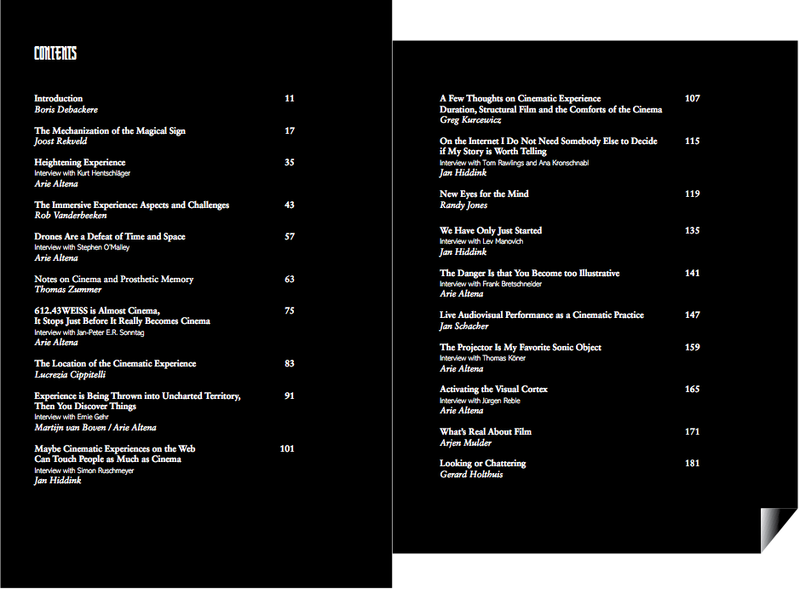 The book focuses both on theories of the cinematic experience, as well as on the practice of artists working in the fields of cinema, contemporary media art and sound. The book offers a many-sided theoretical journey into the history and future of adventurous, experimental cinema. Essays: Joost Rekveld, Arjen Mulder, Gerard Holthuis, Jan Schacher, Randy Jones, Lucrezia Cippitelli, Greg Kurcewicz, Rob Vanderbeeken, Thomas Zummer. Interviews: Ernie Gehr, Kurt Hentschläger, Stephen O'Malley, Jan Peter E.R. Sonntag, Thomas Köner, Jürgen Reble, Frank Bretschneider, Simon Ruschmeyer, Tomas Rawlings & Ana Kronschnabl, and Lev Manovich. Boris Debackere, Arie Altena en Lucas van der Velden, Sonic Acts XII, The Cinematic Experience, Sonic Acts Press, Amsterdam, 2008, ISBN 9789081047029. Interview by Arie Altena with Kurt Hentschläger, Stephen O'Malley, Jan Peter E.R. Sonntag, Ernie Gehr, Frank Bretschneider, Thomas Köner, and Jürgen Reble.